PanARMENIAN.Net - On September 13-19, Vili Galabova, the international wine consultant of CBI Agency - The Centre for The Promotion of Imports - will be in Yerevan. With a more than 15-year experience in wine export, promotion, style, marketing and production, the consultant has once again visited Armenia to support the winemaking companies and structures, interested in the development of the industry. 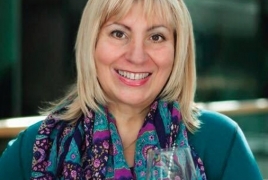 "In the last 3 years, I had the privilege to work in Armenia as a regional wine consultant for a project of the Dutch Ministry of Foreign Affairs (CBI Agency - The Centre for The Promotion of Imports ), supporting the export promotion activities of wine industries in Armenia and Georgia," Galabova says. "Nowadays, the grape/fruit wine and brandy sector in Armenia is one of the crucial segments for the economic growth, employment and tourism sector, so the government should pay special attention to pave the way for sustainable development. Armenia grows quite a few interesting indigenous grape varieties, best among which in my opinion are Areni and Voskehat, both of them with strong appeal and great export potential". Also, she is an expert- sommelier, certified international wine judge, judging for over 10 major wine competitions on 3 continents. “With the kind support of CBI, Armenia had unique chance to present itself at Mundus Vini Competition, Germany in February 2017. Armenian wine had an unprecedented success and scored 9 gold and 14 silver medals out of 58 registered wines in the competition. Another great achievement and recognition for Armenian wine was the Grand Gold medal from Concours Mondial de Bruxelles 2017 for Kataro 2015 and silver for Armenia white 2015. "The participation in a such biggest international competitions is very important in terms of receiving recognition and finding new markets. Of course, it is necessary to enforce food safety regulations to all producers at government level, to correspond to the international wine standards. The next step in this regard is membership in the OIV," the expert said. This autumn, Armenian wine will reach Asia to be represented at a national stand at the Prowein China wine exhibition. "In 2018, the international wine competition Concours Mondial de Bruxelles will have its 25th edition in Haidian district of Beijing (China). This will be the first time a wine competition of this magnitude and significance will be held in Asia, so I highly recommend that all Armenian producers interested in exporting their wines to China, seriously consider using this competition as a tool. This could serve as the next step to enter the new Asian market after the Prowein China 2017," Galabova said. The expert remained hopeful that the wine industry will grow so much in Armenia to allow the country to host a prestigious international wine competition/exhibition one day.